I'm in the huddle looking at Kerry Collins, waiting for the play. I’m thinking, “OK, it's going to be a run for Ron Dayne.” To my surprise, it is a play action pass. My heart starts racing, as I now know it will be a ball to me or Greg Comella. I get to line of scrimmage, I see DE Keith Washington to my right and Bill Romonowski to my left. The ball is snapped, they both step up and I'm all alone in the back corner of the end zone and the ball is coming my way, as are the two guys that I slipped past. It seemed like it took forever, but I catch the ball and get hit. Touchdown! We ended up losing the game, and then got back to Newark airport to find out the the plane that was boarding next to us, waving at us, showing their love for the Giants was the United plane that crashed into the World Trade Center. Then, taking my father-in-law to the airport with my wife, 1-year-old son and 10-month-old daughter, we were stuck in the city for 12 hours witnessing all the destruction and mayhem of 9/11. That's my first memory of being in the NFL. My first game after making the team as an undrafted free agent was on September 10, 2001 for Monday Night Football. New York Giants vs Denver Broncos. 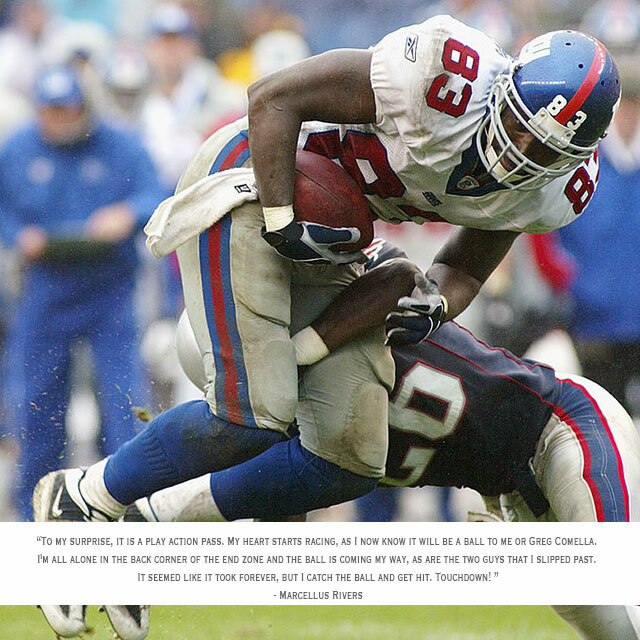 I'm the 3rd tight end on the Giants roster and only go in on goal line situations. After a back-and-forth game, we get a drive going and are on the 3-yard line. All of a sudden I hear, “Goal line! Goal line!” So I go running out on the field at Mile High Stadium, fans screaming, my heart pumping. But I'm ready to help my team.